Mix first 4 ingredients together and marinate flake steak in a zip-lock bag for 1 to 3 hours. Turn occasionally. When ready to cook, preheat grill. Stir sugar and vinegar in a small saucepan over medium heat until sugar dissolves. Remove from heat and add jalapeños, 2 tsp. soy sauce & 1 Tbsp. ginger. Place cabbage, carrots and mint in a medium bowl. Pour the vinegar mixture over the vegetables and toss to coat. Season with Salt & Pepper. Grill the steak for about 4 minutes per side for medium rare. It’s important to make sure the cooked meat has time to rest before carving into thin slices. 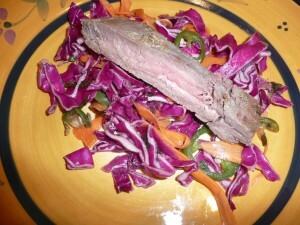 Divide slaw between plates and then top with beef. With Flank Steak you want to cut the meat across the grain… not with it.